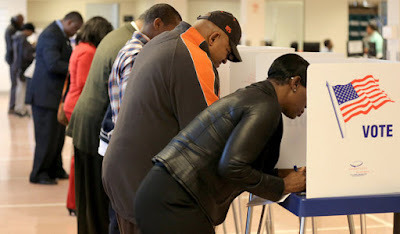 A judge for the US District Court for the Southern District of Ohio on Tuesday ruled that the 2014 elimination of the state's early in-person (EIP) voting was unconstitutional and in violation of Section 2 of the Voting Rights Act. The elimination of the extra days for EIP voting provided by Golden Week will disproportionately burden African Americans, as expert and anecdotal evidence reflects that African Americans vote EIP, and specifically EIP during Golden Week, at a significantly higher rate than other voters. ... [Additionally,] it may be more difficult for voters with time, resource, transportation, and childcare restraints to make two separate trips to register and vote, and Golden Week allowed individuals to do both at once. ... The elimination of [same-day registration] means that voters must now register and vote at separate times, which increases the "cost of voting," especially for socioeconomically disadvantaged groups. Statistical and anecdotal evidence cited by Watson showed support for the claims that African Americans utilized this procedure greater than other groups, and that the elimination of this inevitably places a disproportionate burden on them to the point of violating constitutional rights and the VRA.